Hōnen, a.k.a Honen Bo Genku, (法然; 1133-1212) is credited with the establishment of Jōdo (Pure Land) Buddhism as an independent sect in Japan. He initially studied at the famous temple of Enryakuji atop Mount Hiei, later leaving it to spread his own unique message of salvation to the general population. Hōnen is easily one of the most famous figures in Japanese Buddhism and, unlike his now well-known disciple Shinran, he was renowned in his own day. Simply to bear wholeheartedly in mind the name of Amida whether walking, standing, sitting or lying down; whether one has practiced a long time or short; never abandoning this name from one moment to the next is called the rightly established act because it accords with that Buddha’s vow. As a result of this revelation Hōnen left Mt.Hiei and moved to Hirodani in Nishiyama. Later he moved to Otani on Higashiyama mountain east of Kyoto. He would spend the rest of his life there, except for a period between 1207 and 1211 when he was exiled to Shikoku (due to his disciples converting two of Emperor Gotoba’s ladies in waiting). During the rest of Hōnen’s life he gained many followers and his teachings increasingly drew criticism from the Buddhist esthablishment in Nara and on Mt. Hiei. His written response, the Senchaku Hongan Nembutsu Shu (Passages on the Selection of the Nembutsu in the Original Vow), effectively declared an independent Jōdo (Pure Land) sect for the first time in the history of Buddhism. 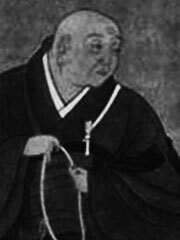 Hōnen had many disciples but the most influential were Shoko-bo (1162-1238) founder of the Chinzei lineage which became the Jodo Shu orthodoxy, Shoku the founder of the Seizan lineage, and Shinran (1173-1262) who inspired the formation of the separate Jodo Shinshu (True Pure Land Sect). Hōnen was said to recite the nembutsu thousands of times a day in his later years. In fact, he died in 1212 whilst reciting the nembutsu. On the latter point Hōnen expressed unusual concern over the spiritual welfare of women. In teaching to them, regardless of social status (from aristocracy to prostitutes), he particularly rejected the significance of menstruation; which wider Japanese religious culture considered to cause spiritual defilement. As a consequence the role of women in the Jodo sects has often been greater than in some other Japanese Buddhist traditions.